Are you looking for breast pump bags for Spectra S1or S2? I know that these two breast pumps are quite bulky and sometimes you need to use a separate bag just to carry this pump. I used to carry one big backpack and one big tote bag every single day when I was pumping for my daughter. It's no fun, but at that time, I didn't even know if there's this thing called a breast pump bag (except the bag that comes with Medela breast pump, of course). A breast pump bag is a multi-purpose bag that allows you to carry your breast pump, cooler and personal items in just one bag. Some bag even allows you to carry a small laptop inside, plus lunch box. And most of them have ample of compartments to help you easily organize your bag content, so that you won't scramble to find tiny little item inside your huge bag. Now would you be interested to be able to carry your Spectra S1 / S2 breast pump, a cooler and personal ﻿belongings with just ﻿﻿one ﻿﻿bag? I bet you are excited. Who likes to drag two or even three bags daily just so that they can pump on the go. The problem is, not all breast pump bag in the market can fit Spectra S1/S2. So, which breast ﻿﻿﻿pump ﻿﻿﻿bag can you use for Spectra S1 and S2? In this post, I'll share my top 5 breast pump bag for Spectra breast pump. Note: not ALL of these bags are originally designed to be a 'breast pump bag', some are, but there are some others (that even though not a breast pump bag), which are still voted as mommy's favorite to carry Spectra S1/S2 breast pump around. This is the most popular breast pump bag brand nowadays. Sarah Wells bag have 2 side pockets that are thermally insulated. The pockets are not the same size, one is bigger so that you can put your Spectra there, whereas the smaller one is for your bottles and pumping parts. Since these pockets are insulated, that means if you prefer to, you can put your bottles / milk bag directly inside the pocket together with an ice pack to keep it cold (up to 6 hours). All of Sarah Wells bag have light-colored inner lining to make it easier to find things inside the bag. 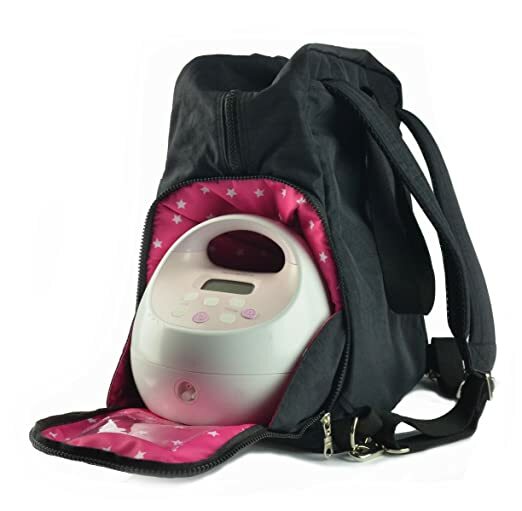 There are several models of Sarah Wells breast pump bag that fits Spectra S1 and S2 breast pump. Among them are Lizzy (pictured above), Annie, Abby, and Kelly. laptop sleeve inside the main compartment to fit up tp 15" laptop. 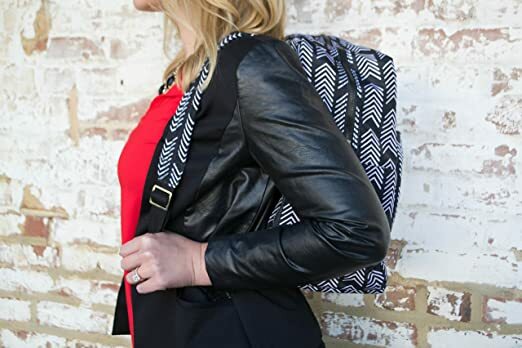 Three colors available: chevron print, greige (this one is fabulous), or plain black (perfect for military mom). Note: Your cooler won't fit in the side pocket together with Spectra, but you can put it in the main compartment together with other personal items. 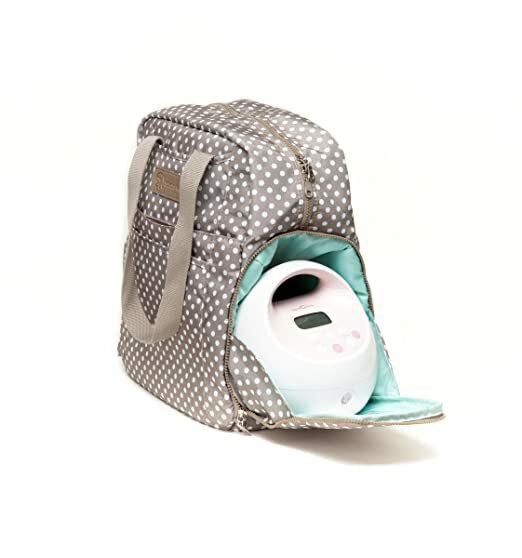 >> Click here to learn more features of Sarah Wells 'Kelly' breast pump bag﻿. Two side pockets with different size (the bigger one is meant for the bigger breast pump like Spectra, while the smaller one will fit a small cooler (like Medela). There's no dedicated laptop sleeve inside main compartment, but I can still fit my 15" laptop inside the main compartment, together with lunch box and personal stuff (pic here). Come with both shoulder and cross-body straps. Different prints and materials are available. Lizzy for full print, Annie for solid color lover and Abby for color-combination lover. >> ​Click on the image to see more pictures of the bag (including real photo of Spectra S1 / S2 inside these gorgeous bag) or click here to read my detailed review of Sarah Wells 'Lizzy' bag. What are the pros and cons of Sarah Wells breast pump bag? Pros:The side pockets are collapsible to create a bigger main compartment. This is great so that you can still continue using the bag as a normal bag even when you are not pumping anymore. Cons: For Kelly, backpack straps are thinly padded, may not be comfortable if you need to wear it for hours. As for now, Sarah Wells 'Lizzy' breast pump bag has been selected as 'Amazon's choice' for breast pump bags. This seems to be new comer in breast pump bag arena, but it's been getting a solid 5-star review from the customers. Personally, I love the look of 'The New Yorker' breast pump bag. The combination of black fabric and gold hardware makes it look so elegant. I love that it has dedicated compartments for every single thing a working-breastfeeding mom need to carry to her workplace. Can you believe that this bag can fit all of the things pictured below? Impressive, isn't it? Two insulated side pockets to house your breast pump and your cooler. One side pocket is bigger than the other, so your Spectra can be safely tucked inside. Pros: Ample of compartments to fit all things that you need to bring to work. 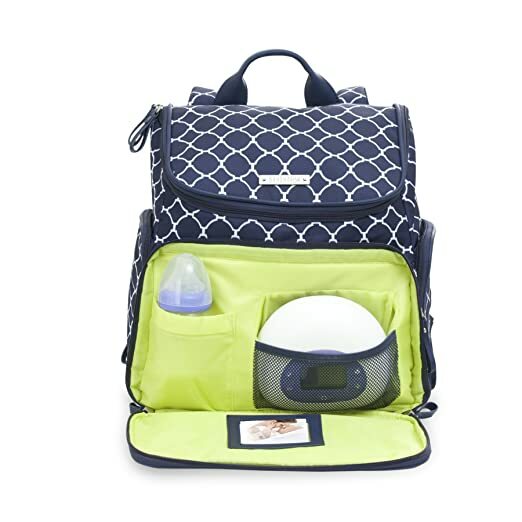 Totally separate compartment between lower compartment (with side access for breast pump and cooler) and upper main compartment, so that your bag is easier to organize. Cons: side pocket compartments stays there, there's no way to make it collapsible to create bigger main compartment, once you are out of pumping business. But I think it is still usable for storing your lunch box and a small water bottle. 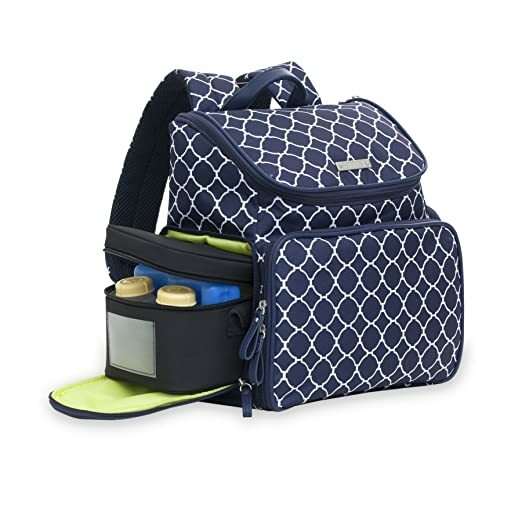 Just like the previous two breast pump bags, Kayla has two side pockets to store your Spectra breast pump and your cooler. I think the distinct difference here is the design and the size. Kayla offers you 'a sturdy' look combined with stripy pattern, plus it's bigger than Sarah Wells and The New Yorker bags. Dimension: 15.8 x 7.9"x 15.8". Two insulated side pockets to keep your Spectra breast pump and cooler. Color: black and white stripe or red and white combo. Pros:Big enough to fit your pump, parts, cooler, laptop (up to 15") and personal items, sturdy material (the bag won't flop when put down). Collapsible side pockets so that you can still use it like a normal handbag once you are not pumping anymore. Cons: Past Kaylaa users noticed that the zippers are sometimes very hard to use, which can be a problem if you are in rush for pumping. Bananafish breast pump bag has one big side pocket that's supposedly for your cooler, but hey, it's big enough to fit your Spectra S1 or Spectra S2! Other than that, it has one front pocket (supposedly to hold your pump, but you can put your pump accessories there), one more small side pocket (for tubings and such), and ample space in the main compartment. Two insulated side pockets (one big pocket for your breast pump and smaller one for chargers, tubings), one front pocket that opens up all the way down, and ample space in the main compartment. There are 3 distinct design that you can choose: back-pack style, tote style, and one with long-shoulder strap. I've heard from a reader that it's the backpack style that will fit Spectra nicely, but looking from the reviewers' image, the other models seems fit as well. C﻿heck out the customer image here before buyi﻿ng. Price is a lot more affordable (less than half price of other breast pump bags)! Check out the latest price here. Pros:Big enough to fit your pump, parts, cooler, and personal items. Cons: Does not seem to have insulated pocket, so you must bring your own cooler. Ok, this is not originally intended to be a breast pump bag. It's a diaper bag, but it's big enough to carry your Spectra S1 breast pump and cooler around. Plus point, it has a lot of compartments (even a dedicated mommy pocket - think about purse, sanitizers, wipes, pumping bra), so that you can easily organize the content of your bag. A lot of compartments: dedicated mommy pocket. main compartment with zipper goes all the way down, another snap-on pocket just in betwen main compartment and mommy pocket for magazines, ipad, small laptop, etc, and one more pocket in the back (that's originally used for diaper changing pad), but you can use it for documents, etc. Cons:​ No special compartment for your breast pump and cooler (these will go to the main compartment). Note:​ This bag does not come with a backpack strap. If you are looking for Ju Ju Be bag which has similar design to Be Prepared but with backpack strap, take a look at Ju Ju Be BFF Legacy. There's a thorough review on how this bag performs as a breast pump bag here. If you are in the look for a bag that can be used for both diaper bag and breast pump bag for your Spectra, I seriously think Ju Ju Be Be Prepared ​will be worth your investment. ​Now, if you want a super custom look, a breast pump bag that's fully customized for your need, you may be interested in Ella Alana breast pump bags. These bags are custom made based on customer request, from fabric choice, extra pockets, and whether it comes with a matching cooler. The original design is very similar to Medela tote bag, so the breast pump has a separate compartment that is accessible from a zippered front-flap. There's a little mesh pocket to put your tubings there. And finally you can put your cooler and personal items inside the main compartment. Cons:​ the price tag is quite hefty (but considering that you get a unique look, perhaps it's worth the price). Now, come the big question. Do you want a well-known, branded breast pump bag? Go for Sarah Wells. Do you need a great-looking breast pump bag with easy organization? Go for 'The New Yorker' or 'Ju Ju Be', or Kaylaa. Are you budget-constrained? Go for Bananafish. Want a fully-customized design? Ella Alana is for you. I hope this article helps you to decide which breast pump bag is best for your Spectra S1 and S2 breast pump. Do you use a breast pump bag in the first place? Not yet, but I’m just as curious as you are… If I were in USA, I would have purchased it, lol. Unfortunately, I am based in Asia, so the shipping cost is a little high. If you end up buying it, do let us know about your experience. Thank you for including us in your roundup Rina! I designed the New Yorker specifically to fit all portable breast pumps, including larger models like the S1/S2. Our bags are only available in the United States right now unfortunately, but we are hoping to offer some international options in the future. I found this great choice at Babies R Us (it’s called Bananafish Madison bag) for $50. I plan on carrying my Spectra S2 and a small, 4-bottle cooler w/ice pack, as well as the pump accessories and there is plenty of room for it all. The pump fits in the side pocket as opposed to the front pocket, so don’t expect to use it as pictured by the manufacturer, they use a small model pump with the bag but if you look at the customer-submitted picture, you can make out the Spectra S1, which, from what I understand, is the same exact size as the S2, the only difference being that the S1 has an internal rechargeable battery. I was happy to have found this after MUCH research. I hope the information helps someone trying to resolve the same problem. Happy pumping! Thanks for letting me know that this bag fits Spectra S2. Finally.. there’s a decent bag, not too pricey, that fits Spectra. yay.. I hope there will be more and more options for those carrying Spectra S1/S2 around. This is very helpful! I pumped for baby #1 with a Medela PISA. Heading back to work in a few weeks following baby #2 and I have a bulky Spectra this time. This article has been very helpful, as I know exactly what’s important to me in a pumping bag this time, and this article provides comprehensive guidance and reviews!